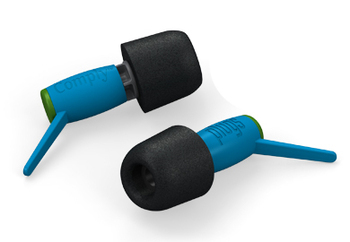 Comply™ Foam Plugs are designed for music: practice, performance, and attending shows. With NRR 15 noise protection, these foam ear plugs for musicians will help prevent hearing damage and tinnitus with minimal distortion of sound. With these ear plugs in, you'll still be able to hear what's going on around you, including detailed music and voices. What makes Comply™ Foam Plugs different is that these are foam-tipped musician's ear plugs. Most ear plugs for music are made of silicone and have a multi-flange fitting system. These are different. 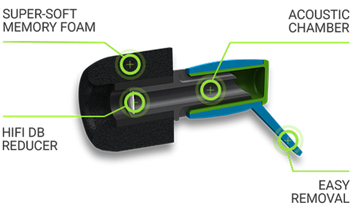 Comply Foam Plugs have super-soft memory foam tips, which some users may find are more comfortable than the silicone alternatives, which don't always breathe as well as foam. Normal foam ear plugs aren't great for audiophiles. They offer the most noise blocking in the mid and high frequencies, and the resulting sound quality is muffled and muddy. When you need maximum noise protection, that's fine, but when you're at a show, you want clear sound. That's what Comply™ Foam Plugs offer: their high-pass filter blocks sound evenly across all audible frequencies, so you get to hear the music clearly, with minimal distortion, while still protecting your ears.